I write about this during the holidays every year, since wine and chocolate are two of life’s greatest pleasures, and two items we often pair up in our gift sets. But sometimes they are hard to pair together. 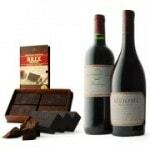 We often reach for red wine and sweet chocolate – a dangerous pairing as the sugar in the chocolate can make the tannins in the red seem ultra bitter. Yum… chocolate dessert. From cake to mousse to souffle, chocolate desserts are popular and delicious. Port is a classic for all types of chocolate – truffles, cakes, etc. All sorts of port, but particularly tawny port, due to the nutty flavor, matches well chocolate desserts, particularly those with nuts in them. Try also Australian Muscat, Banyuls or another fortified wine. Previous PostTips for stress-free holiday entertainingNext PostFun ways to re-use your corks!